Posted By:Unknown | At:1:54 PM Be the first to comment! (Mediaite) --- On Monday, CNN Starting Point host Soledad O’Brien delved into the death of Trayvon Martin, the unarmed teen who had been shot by George Zimmerman, a neighborhood watch captain, while walking back from a convenience store. Martin’s family, O’Brien reported, is now pressing the Justice Department to become involved following the release of seven 911 calls made by neighbors the night Martin was killed — including one made by Zimmerman himself, a snippet of which O’Brien played for viewers. 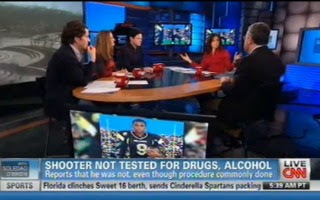 CNN senior analyst Jeffrey Toobin stopped by the show to weigh in further on the tapes and Martin’s case. “Right, said Toobin, “which would suggest it was Trayvon Martin screaming and not Zimmerman.” Toobin later noted that, as a member of the community’s neighborhood watch team, Zimmerman would not have been given any special rights or authority regarding gun usage.